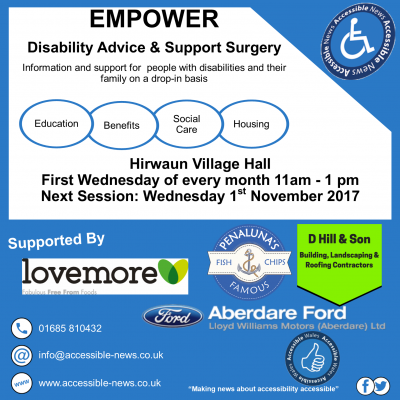 In September volunteers of Accessible News successfully launched our Empower Disability Advice and Support Surgeries thanks to support from local businesses. These surgeries take place the first Wednesday of every month and are based in Hirwaun Village Hall (11am – 1pm). I’ve chosen to support Accessible News to set up Empower because I believe that the service is extremely valuable to the community. This country is going through a period of financial hardship and I feel supporting the most vulnerable members of the community is important. I had a vision at the age of sixteen of setting a one-stop-shop for disability related queries, I think the Empower Surgeries make big steps towards achieving that goal. We are here to help and support people, pointing people in the right direction of specialist help and supporting them during the process. Our next session is taking place on Wednesday 1st December in Hirwaun Village Hall (11am – 1pm), if you’d like to know more visit our Facebook Page or check out our website.